3 Schlafzimmer, 2 Bad Haus auf fast ein Morgen. Gehen Sie aus Hinterhof in landschaftlich Hoffmaster State Park, trifft zur 1 Meile Strecke bis zu den Sanddünen des Lake Michigan, und sehen Sie die schönen Lake Michigan und Waters Beach. Das Haus ist 10 Minuten von Norton Shores Lebensmittelgeschäfte, 15 Minuten von Down Town Grand Haven, wo Sie Geschäfte und Uferpromenade genießen. Grand Haven ist die Heimat von US Coast Guard Festival, Cascades Farbe Wasser-Show jedes Wochenende. Holland Michigan ist 30 Minuten entfernt für Tulip Festival. Sleeping Bear Sanddünen sind Nord. Bord der Muskegon Fähre 20 Minuten nördlich des Hauses, um die Fee über See Michigan nach Wisconsin zu nehmen. Nehmen Sie eine Kutschenfahrt durch die Stadt Muskegon. Halbe Meile von Mt Garfield Motorrad-Bergrennen. Mehrere Radwege in der Nähe, einschließlich Lakeshore Radweg. Pros: 3 stars because, Owner responds quickly, Close to beach, lovely neighborhood, quiet, private, organic cotton towels. Cons: It was not clean when we arrived. Appears not to have been cleaned well for a long time. Smell of mold prevented us from spending time in family room. We arrived late at night. I cleaned the house when I got up in the morning and sent a text to the owner. She apologized and offered to have the cleaning crew come that afternoon. I declined since I had already cleaned enough to get us by. The door was missing from one of the bedrooms and the back door latch was not working. The owner got the handymen out there, same day (on a Sunday afternoon) to fix them. They also cleaned the porch of the massive amount of spider and cob webs, dead bugs etc. and offered to do more cleaning. When I say, not clean, this is what I mean: spiders, spider webs and dead bugs in master bath window sill, next to bathroom mirror, in corners, appears not vacuumed, swept, or dusted. I wiped a thin layer of dirt from the kitchen and bathroom counter tops. Dust accumulated on/in baseboard heaters, skylight full of bugs, old abandoned bird nest over entry door, cob webs around entry door. Kitchen sink had food stuck in it. This house is so close to our family and the beach I was hoping it would work. I would rate this rental as 1-2 stars. It was not our standard and honestly, I could not wait to leave. I gave it 3 stars because I sent pictures to the owner and I believe she will get it fixed. We rented this house last summer (2017) and loved it so much we booked it for 2018 on our way home! There was room for everyone (4 adults, 2 kids and a dog; plus some nights with 2 more adults and 2 more kids!). There were also plenty of sheets, towels, etc for everyone. They even have toys and books to share. This house is in a great, small, safe little neighborhood, with a great beach, creek and dune, if you are willing to work just a little to get there on a path through the woods. 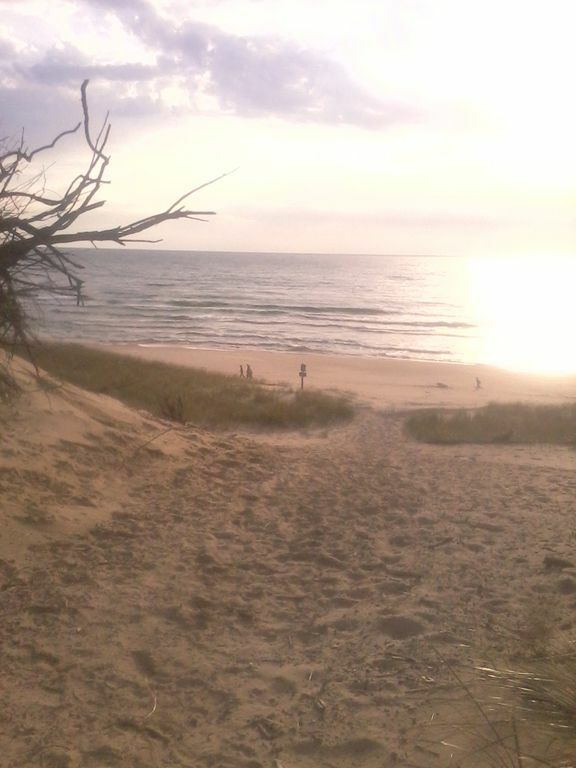 It is also close to so many great beach towns and the city of Grand Rapids. After two summers of visiting we still have exploring to do! Great space for a weekend at the shore. This home was very spacious, it's a comfortable stay for 7 adults + 1 child. Big kitchen and living room with big windows looking out to the backyard that is full of ginormous trees and lots of greenery. Beach is walking distance through a forest area with a trail; very easy to get to. The owners were very helpful, always available through text or email and always responding in a very timely manner. Absolutely loved the bonfires in the backyard at night! Rented this house for a 3 night weekend stay with my Grandson & his Mother. There were 5 of us all together & the house had plenty of room for us all. The neighborhood was quiet, the house beautifully decorated & it was located close to town, state park & the lake. Beds were comfortable & the owner was quick to respond when I had a question. My only problem with the house would be the housekeeping. While the main parts of the house were clean, it looks like it had been a while for the under & behind parts. Would recommend this home to anyone. Would also recommend hiring a different housekeeper. Great house - Plenty of room - Great Location!! I had my brother's and their wives here for Thanksgiving. Kitchen is very spacious and is stocked with plenty of utensils- pots ,pans, silverware. Location is great. This time of year can be a little chilly and I was concerned about the warmth of the home but it was fine. My brothers and their wives did walk to the beach and other paths. The only problem we had was not being able to get the football game on at Thanksgiving. We had a problem with the TV. Anytime I contacted the owner she was very helpful. I did not want to bother her on Thanksgiving so we listened to music instead. Overall I would highly recommend this vacation house.